Expanding on Olafur Eliasson’s long-term engagement with natural environmental phenomena, this work takes the form of a cubical concrete sculpture. Grotto-like interiors are visible inside the cube through irregular openings in its smooth concrete outer walls. Formed by casting blocks of glacial ice in concrete, the sculpture is an indexical trace of the now-melted ice, only present as absence. To form this work, Eliasson used ice from the Greenland ice sheet, formed over millions of years by layer upon layer of highly compressed snow, and placed it in a wooden casing at his studio. Concrete was poured into the casing and the ice was left to melt away over a period of about a month. 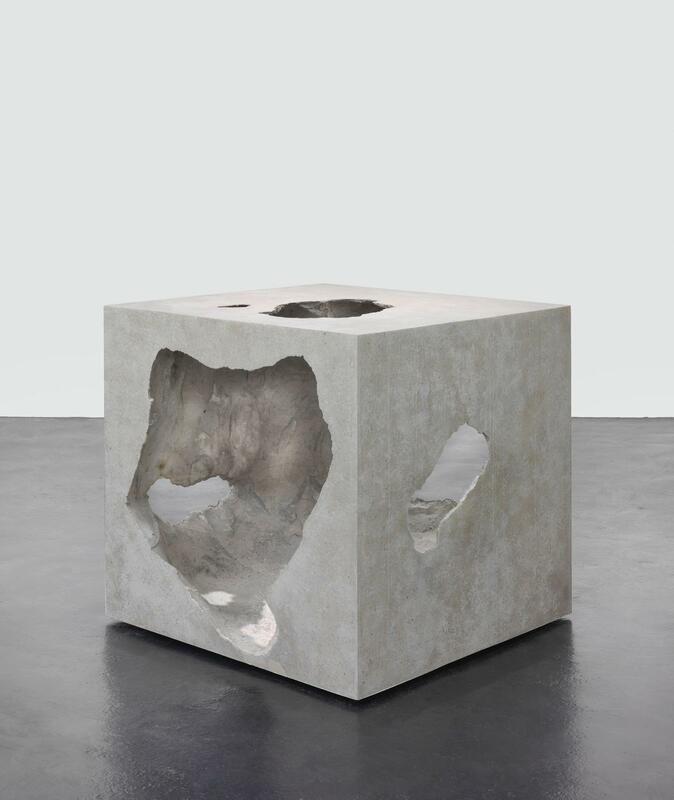 The melting glacier produced sounds like miniature explosions as it carved out voids within the cube, puncturing in the concrete walls and leaving only the memory of the ice within the artwork.